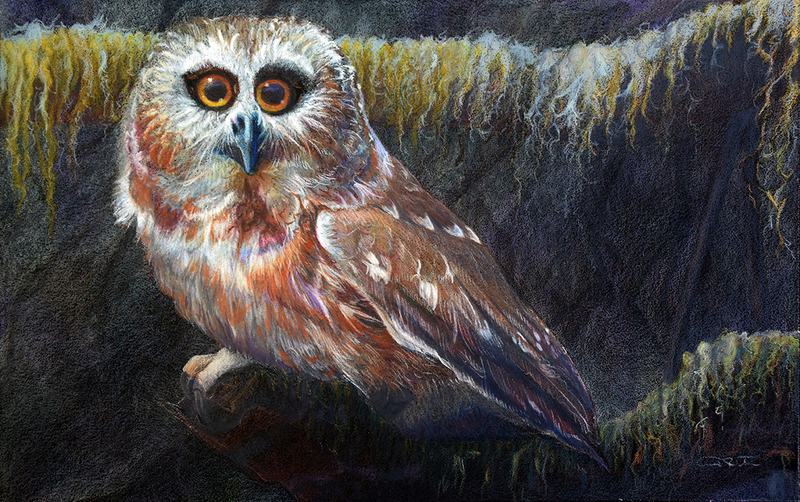 Allison Richter’s newest individual work, “Moss Ado About Nothing”, composed of Prismacolor pencil on paper, features a saw whet owl, perched on the branches of a moss covered forest tree. The dark nature of this 8.75″ h x 13.5″ w black tinted paper gives the impression of the owl’s natural hunting hours, the deep of night. The composition of the tree where the owl resides, as well s the moss that adorns it, has the lush rich feel of the mystery-enshrouded forest. The star of the piece, the owl itself, peers at the viewer from the cover of night. The close-set eyes of the saw whet owl gives its gaze a penetrating intensity. Whether just starting your art collection or looking to add a new beauty to your your current collection, the “Moss Ado About Nothing” one-of-a-kind artist signed original is available to purchase below. Appreciate this artist crafted, detailed, Prismacolor and Faber Castle original artwork on grit paper in your own home. “Moss Ado About Nothing” brings an incomparable charm that can bring some of the elements of nature indoors. Whether adding a sense of escape to the office, enriching the home, or adding some extra flavor to that special vacation retreat, your new artist signed giclee can even more life to your interior space.